1933 Born, the second son of a Buddhist priest, in Yonezawa, Yamagata Prefecture in Japan. Grows up in Tokyo.1947 Adopts the name “Eikoh” as a symbolic gesture to acknowledge the new era in Japan. 1952 Enrolls at the Tokyo College of Photography. 1956 First solo exhibition, An American girl in Tokyo, at the Konishiroku Photo Gallery in Tokyo. 1960 Yukio Mishima becomes interested in Hosoe’s work. Directs an experimental film Navel and A-Bomb. 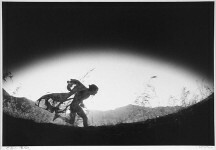 Mishima invites Hosoe to photograph him for the cover of his book, Attack on Beauty. Hosoe asks Mishima to continue posing for him. The result is the Barakei series. Killed by Roses, a book on the Barakei series is published (Tokyo: Shueisha, 1962). Gaudi’s architecture has a profound effect on him. 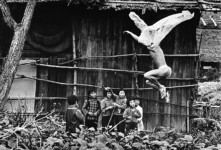 1966 Participates in Ten Photographers exhibition at the National Museum of Modern Art, Tokyo. 1970 Yukio Mishima commits ritual suicide while Killed by Roses is being prepared for re-publication. 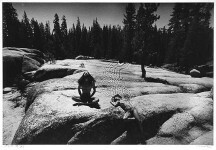 1972-74 Meets Ansel Adams. 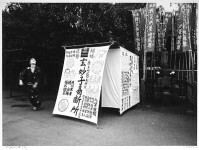 Lectures and holds workshops in the U.S.
1975 Accepts professorship at the Tokyo College of Photography. 1977 Travels to Barcelona. Begins to photograph Gaudi’s works. 1982 Discovers “Mini-Graphs” – test prints torn by hand and mounted on card. 1995 Becomes first director of the Kiyosato Museum of Photographic Arts. 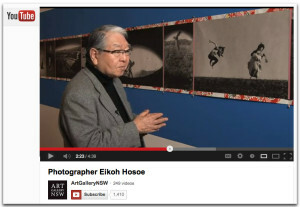 Eikoh Hosoe is widely regarded as one of Japan’s greatest contemporary photographers, and is a pivotal figure in the development of Japanese photography. His photographic series create narratives which explore themes drawn from traditional Japanese culture that have been mixed with external influences. These series were produced primarily for publication in Japanese books rather than for exhibition, making the present exhibition extremely important to Hosoe’s recognition outside of Japan. In the early 1950s, Hosoe was a key contributor to an expressive style that emerged during the postwar era as a reaction against the realist documentary tradition previously prevalent in Japanese photography. 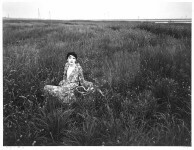 Hosoe and a group of similarly-minded artists were influenced by the American notion that photography could be a medium of personal orientation, and experimented with photographic materials and techniques as a means to greater interpretative ends. Hosoe’s first series, Man and Woman, 1959-60, was inspired by a performance given by Tatsumi Hijikata, the originator of Butoh, an avant-garde form of dance/theater that addressed the psychological and emotional confusion of postwar Japan. 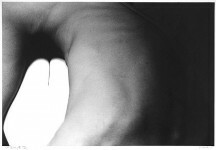 In Man and Woman, Hosoe explores the elemental relations between the sexes by using members of Hijikata’s dance troupe as models within the confined space of Hosoe’s studio. The combination of models who exude great physical presence, the disturbing sense of space, and Hosoe’s overt manipulation of the photographic process contribute to the depiction of tensions at the heart of male-female relationships. Working in collaboration with the famous Japanese writer Yukio Mishima, Hosoe produced his next series, Barakei or Ordeal by Roses, 1961-62. 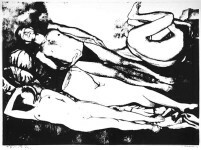 Barakei is a complex work that uses Mishima as the primary model in a study of entangled eroticism, suffering, and martyrdom. 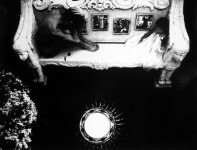 Hosoe employed a full range of techniques, such as bird- and worm-eye views and double printing, to weave the baroque backdrop of Mishima’s house and Christian and pagan symbols into a seamless though bizarre reality. 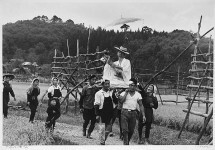 The highly staged scenes are evidence of Hosoe’s belief at that time that photographs should be assembled, not discovered. 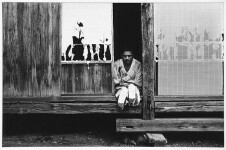 The success of Barakei’s publication in 1963 placed Hosoe in the vanguard of Japanese photography. 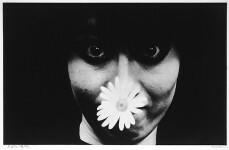 Eikoh Hosoe lives in Japan where he is a professor of photography at the Tokyo Institute of Polytechnic. He frequently teaches workshops in the united states. 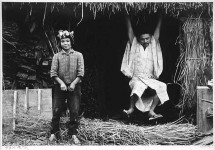 Hosoe’s photographs are included in the collections of The Museum of Modern Art, New York City; the Bibliotheque Nationale, Paris; and the victoria and Albert Museum, London, among other institutions.